Are you frustrated with battling excess weight? Feeling you will never lose it? Are you frustrated with losing a few pounds, strong early progress, just to gain back every pound and more? 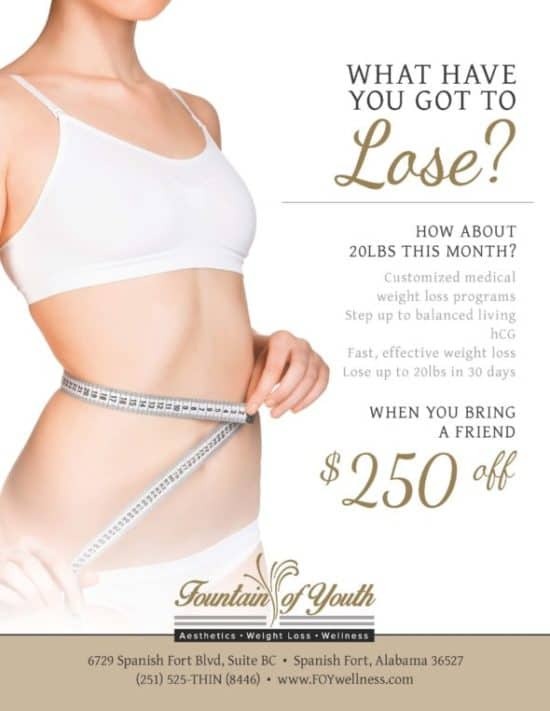 Fountain of Youth offers a physician and practitioner guided and monitored Rapid Medical Weight Loss Program which includes consultations to develop a personalized weight loss plan with a BMI assessment, weight loss injections, diet and meal planning and post-program patient support, all designed to help you achieve realistic and attainable goals. This is a physician and practitioner developed and supervised program. We are with you every pound of the way to your weight goals… call 251.525.8446 to get started now.